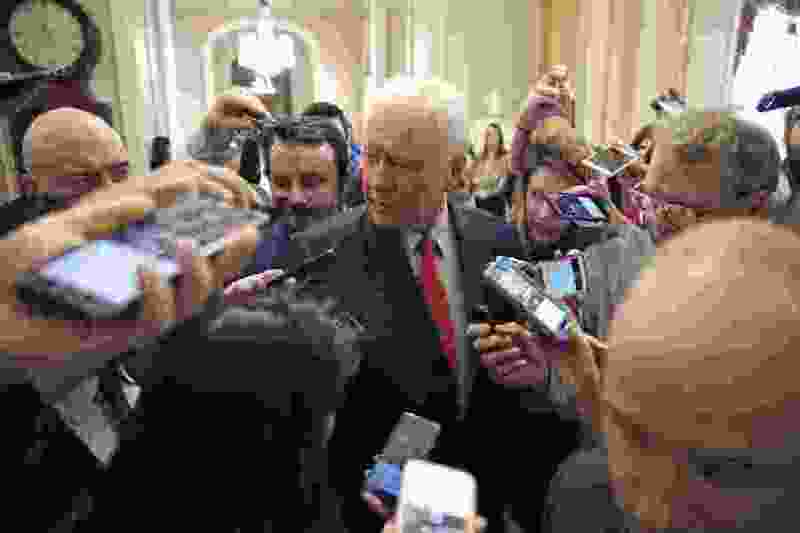 Washington • Sen. Orrin Hatch strongly defended Supreme Court nominee Brett Kavanaugh on Thursday, arguing there was not enough evidence of accusations of sexual misconduct against him and the Senate should vote to confirm him. Hatch, a former Judiciary Committee chairman who has been a key cheerleader for Kavanaugh, said there should be a “presumption of innocence” for the him and there wasn't enough proof to hold up the nomination. “Judge Kavanaugh has been a federal judge for 12 years,” Hatch said during the daylong hearing. “He’s earned a reputation for fairness and decency. His clerks love him. His students love him. His colleagues love him. “This man is not a monster,” Hatch continued. The Utah Republican said that Christine Blasey Ford was a “very good witness” and was “very self-assured, very interesting” but that Thursday's hearing – where she testified emotionally about her allegation that Kavanaugh had held her down -- groped her and covered her mouth when she tried to scream, didn't have any corroborating evidence to back up the claim. Kavanaugh fiercely denied the accusation later in the day, at times growing angry in his remarks and under questioning by Democratic senators. “Every Senator has to decide [whom] they believe, and that threshold must acknowledge that Judge Kavanaugh deserves the presumption of innocence,” Hatch said. “I have not heard enough to believe that we should postpone our committee vote tomorrow, but I will leave that decision” to Judiciary Committee Chairman Chuck Grassley. Both Hatch and his Senate colleague from Utah, Mike Lee, passed on asking questions of Ford, as did all Republicans on the Judiciary Committee, tasking an Arizona county prosecutor, Rachel Mitchell, to quiz her instead. “If you search his past quotes you’ll see he’s used it consistently for years for men and women he believed has compelling personalities,” Whitlock wrote. Lee, who is also a member of the Judiciary Committee, noted while questioning Kavanaugh that the nominee couldn’t request an FBI investigation as Democrats have demanded. But, Lee said, he will back Kavanaugh because he doesn’t believe the nominee was the perpetrator. The senator had been relatively silent on whether he believed the accusers claiming sexual misconduct by Kavanaugh – other than Ford, two other women allege Kavanaugh acted inappropriately in high school and later in college.